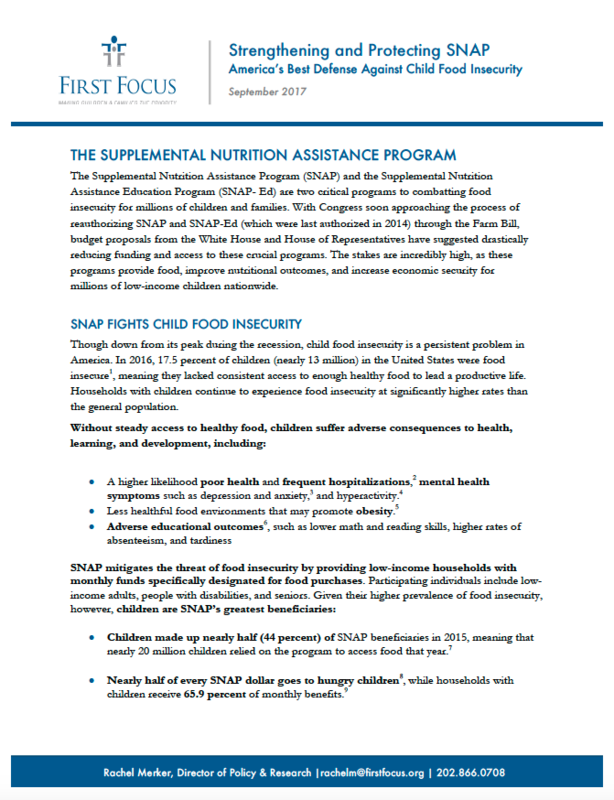 The Supplemental Nutrition Assistance Program (SNAP) and the Supplemental Nutrition Assistance Education Program (SNAP- Ed) are two critical programs to combatting food insecurity for millions of children and families. With Congress soon approaching the process of reauthorizing SNAP and SNAP-Ed (which were last authorized in 2014) through the Farm Bill, budget proposals from the White House and House of Representatives have suggested drastically reducing funding and access to these crucial programs. The stakes are incredibly high, as these programs provide food, improve nutritional outcomes, and increase economic security for millions of low-income children nationwide. A higher likelihood poor health and frequent hospitalizations, mental health symptoms such as depression and anxiety, and hyperactivity. Less healthful food environments that may promote obesity. Adverse educational outcomes, such as lower math and reading skills, higher rates of absenteeism, and tardiness.